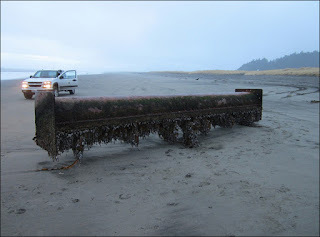 In the tradition of keeping my blog post titles as terrible puns, today's post is regarding a giant pipe that has washed up on the Washington shoreline. Perhaps not the most exciting piece of giant debris that could possibly wash up, it is there nevertheless. The pipe was noted by beachgoers on Tuesday, Jan. 29th just below the high tide line at Cape Disappointment (I tried to think of several jokes here...). It is approximately 19 feet long and 3 feet in diameter. The pipe is covered in marine species, but the verdict isn't out yet regarding whether there are invasive species or not. A closer examination of species will allow researchers to better determine the pipe's origin. As of now, there is not confirmation if this is tsunami debris or not. More soon! The coasts of British Columbia are known for being pristine, secluded, and now, very difficult to clean up. Recent fly overs by members of West Coast Helicopters have revealed miles of debris along remote shores. As noted by The Globe and Mail, there appeared to be "garbage scattered on almost every beach for more than 100 kilometres..." The observer, Peter Barratt, noted that as compared to the past 30 years, there appears to be about 3-4 times more high floating debris, such as large chunks of styrofoam, and 5-10 times the normal amount of small debris. Mr. Barratt noted that much of the debris appeared to be newer. West Coast Helicopters plans more in-depth flyovers when the weather improves, and the BC government will likely formulate a cleanup plan for this and other trouble areas. This brings to mind the fact that styrofoam is one of the most pervasive and detrimental debris types. Styrofoam does not naturally biodegrade, but instead breaks down into smaller and smaller pieces (much like plastic, mentioned in my last post) which either are consumed by wildlife or work themselves into the environment once they are too small to pick up. 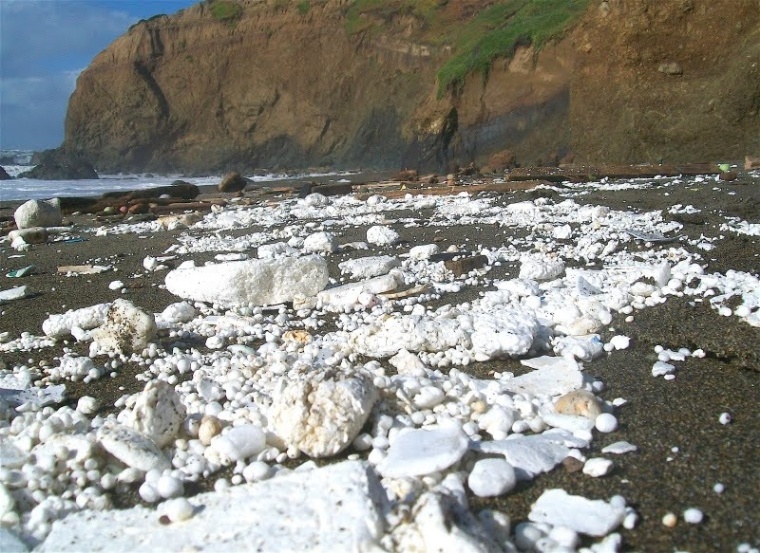 Numerous coastal communities have pushed for a styrofoam ban. To learn a bit more about styrofoam's impacts, as well as potential regulations, check out San Juan Capistrano.org. If you see styrofoam on a beach and have a means to do so, please pick it up and dispose of it properly. The bigger the piece the better, as this will slowly degrade over time. Do a little to make a big difference! On a brief note, NOAA has reported that they have confirmed 20 of the 1,479 reported debris reports as debris relating to the 2011 tsunamis. Additionally, NOAA has recently updated its website with a new debris model, formulated as of January 7, 2013. The new model shows the majority of debris less than 750 miles from the west coast of the US. Visit NOAA's Debris Model webpage for a better version of the map below.